Sanders is a socialist -- not just socialistic, as opponents accuse Hillary and Barack Obama, but a full-fledged proud, self-described socialist. Sanders, however, is an ELECTABLE socialist, because he declines to adhere to the revolutionary aspects of the Socialist Party. Sanders was first a member of the Liberty Union Party, then was elected as a Socialist Party member as mayor of Burlington (the largest city in Vermont), then as in Independent to the House and then the Senate, and is now running as a Democrat for president. Sanders is running as a Democrat for president because he wants to be heard (running as a Socialist, he would not be!). Many people say, "Well, how could he beat Hillary?" but that is not Sanders' purpose. 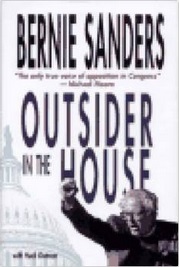 In describing his 1986 run for governor, in which he only got 14% of the vote, Sanders writes, "We had lost badly but, if the truth be known, we felt pretty good. We raised the right issues, [and had] won the support of many working-class people from all over the state" (p. 79). In other words, "raising the right issues" was Sanders' purpose, not simply winning. That purpose would apply to running for president as well. Sanders will force Hillary to address corporate welfare issues, to justify over-militarization, and to focus on the needs of the many over the needs of the wealthy few -- those are Sanders' pet issues, as outlined in this book. Some people think Senator Elizabeth Warren (D, MA) should fulfill the role of Hillary's conscience during the Democratic primary, but Warren has declined repeatedly, while Sanders has traveled across Iowa preparing a campaign. Indeed, Sanders accepts the role of the conscience of Congress too: "I have come to understand that one of the most important roles I can play in Congress is to raise issues which, for a variety of reasons, other people choose not to deal with. Just shifting the framework of debate can have enormous consequences" (p. 106). Sanders will assuredly shift the framework of debate if Hillary agrees to primary debates. What Senator Warren means when she says that she won't run is that she doesn't enjoy the process of campaigning. She certainly enjoys her role as "conscience of Congress" on corporate matters, but that affects decisionmakers and not the general population. Sanders considers his role to be more focused on campaigning and on educating the general population: "I enjoyed the experience of running for office very much. What excited me most was the opportunity to express to the people� views which many of them had not heard before. Again and again that summer and fall, I articulated my belief in economic democracy and social justice" (p. 16). Those terms -- "economic democracy and social justice" -- are not terms that are commonly heard on the presidential campaign trail. And Sanders is just the guy to introduce the terms to the American public. Bernie Sanders: Women have the right to choose, regardless of income. Bernie Sanders: 1964: civil rights activist in Congress on Racial Equality. Bernie Sanders: Never accept racism, sexism, nor homophobia. Bob Dornan: OpEd: Homophobic diatribes in House speeches. Duke Cunningham: Condemned for commenting on "homos" in military. Socialist Party: Never accept racism, sexism, nor homophobia. Steve Gunderson: Openly gay & only Republican to oppose DOMA. Bernie Sanders: Cap deductions for CEO pay; count perks as profit. Bernie Sanders: In 1980s, wealthiest 1% got 2/3 of all wealth increases. Bernie Sanders: The needs of the rich & large corporations are never ignored. Bernie Sanders: Stop $31M Pentagon payments for corporate mergers. Socialist Party: In 1980s, wealthiest 1% got 2/3 of all wealth increases. Socialist Party: The needs of the rich & large corporations are never ignored. Bernie Sanders: 1976: produced educational filmstrips on New England history. Bernie Sanders: Gas tax increases are regressive. Bernie Sanders: Cut subsidies of wealthy farmers; increase grazing fees. Bernie Sanders: City residents often frozen out of development decisions. Bob Barr: OpEd: married three times, but opposes gay marriage. Enid Waldholtz: OpEd: Pressed charges against husband, but supports DOMA. Newt Gingrich: OpEd: refused to pay child support, but supports DOMA. Bernie Sanders: War is a local issue because local youngsters fight and die. Socialist Party: War is a local issue because local youngsters fight and die. Bernie Sanders: US trade policies represent interests of corporate America. Bernie Sanders: Agreed with Ross Perot's critique of trade policy. Bernie Sanders: NAFTA was a sellout to corporate America. Bernie Sanders: NAFTA, GATT, and MFN for China must be repealed. Bill Clinton: OpEd: supporting NAFTA was sellout to corporate America. Bernie Sanders: Low-income workers don't vote because it's irrelevant. Bernie Sanders: Competitive bidding saves government money. Bernie Sanders: Publicly fund elections, or small individual contributions. Bernie Sanders: Receives more contributions, but fewer dollars, than GOP. Bernie Sanders: Accepts PAC money, but not from special interests. Bernie Sanders: Same-day automatic voter registration & 3-day voting. Republican Party: OpEd: GOP matches agenda of wealthy & corporate leaders. Socialist Party: Competitive bidding saves government money. Socialist Party: Publicly fund elections, or small individual contributions. Socialist Party: Receives more contributions, but fewer dollars, than GOP. Socialist Party: Accepts PAC money, but not from special interests. Bernie Sanders: I'm pro-hunting, but no one needs an AK-47 to hunt. Bernie Sanders: 1972: Pushed for dental care for low-income children. Bernie Sanders: Civilized societies provide healthcare for the poor. Bill Clinton: OpEd: single-payer advocates opposed 1990s healthcare. Hillary Clinton: OpEd: 1993 debate was highest level ever reached. Bernie Sanders: Oppose outrageous boost in military expenditures. Bernie Sanders: End nuclear weapons and B-2 bomber production. Bernie Sanders: 1991: Billions should improve human life, not destroy it. Bernie Sanders: Pentagon lied about Iraq; expect same for future wars. Bill Young: Opposed $31M bonuses during defense contractor layoffs. John Murtha: Opposed $31M bonuses during defense contractor layoffs. Bernie Sanders: English-Only, based in xenophobia, hurts legal immigrants. Republican Party: Increasing minimum wage makes country uncompetitive. Bernie Sanders: 1971: Ran for Vermont Senate seat under Liberty Union Party. Bernie Sanders: Revolution will not start at "progressive bastion" Harvard. Bernie Sanders: First Independent elected to Congress in 40 years. Bernie Sanders: GOP convinces middle class to vote for interests of the rich. Bernie Sanders: Progressive movement fights for social justice. Ross Perot: OpEd: 30-minute infomercials better than 30-second ads. Socialist Party: Revolution will not start at "progressive bastion" Harvard. Socialist Party: 1990: First Socialist elected to Congress in 62 years. Bernie Sanders: It's regressive to increase taxable Social Security income. Bernie Sanders: Cap the home mortgage interest deduction at $300,000. Bernie Sanders: Property taxes are highly regressive & hurt poor & seniors. Bernie Sanders: 1% room-and-meal tax instead of property tax. Bill Clinton: OpEd: 1993 budget included mostly progressive taxation. Socialist Party: 1% room-and-meal tax instead of property tax. Bernie Sanders: Sued cable TV company to pay city for damaging streets. Socialist Party: Sued cable TV company to pay city for damaging streets. Bernie Sanders: 1983 war against Nicaragua was illegal and immoral. Bernie Sanders: 1990: Opposed authorizing all-out war in Kuwait with Iraq. Bernie Sanders: 1991: instead of Persian Gulf War, spend on America. Socialist Party: 1983 war against Nicaragua was illegal and immoral. Bernie Sanders: Economic insecurity is pivotal in how one lives one's life. Bernie Sanders: Land Trust: affordable housing by resale below market rates. Bernie Sanders: Opposed cutting food stamps. Bernie Sanders: U.S. has highest income inequality in industrialized world. Rush Limbaugh: The poor get all the benefits in this country. Socialist Party: Land Trust: affordable housing by resale below market rates. Socialist Party: Neither Dems nor GOP talk about income inequality. by Bernie Sanders and Hank Gutman.